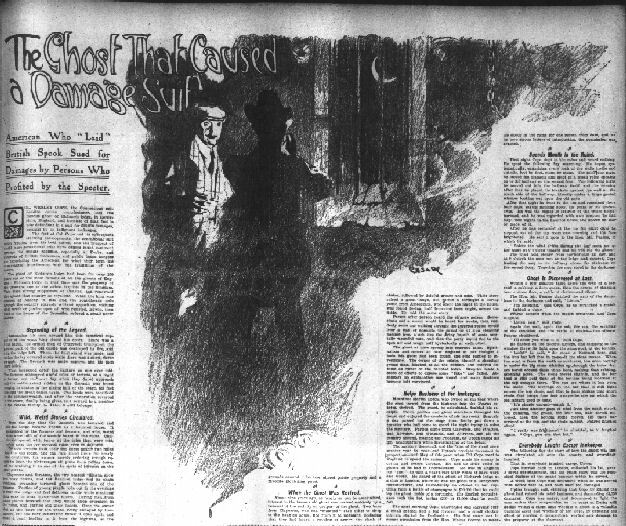 New York, June 11 – Rented – one ghost – a real, geunine, historic ghost – one of the most exclusive ghosts in all tradition – none other than the ghost of Warwick castle, which, with all other appurtenances of that famous mansion, has just become the property for a term of years of Mrs. Henry W. Marsh, of New York and Chicago. Mrs. Marsh hasn’t seen the ghost yet! But she believes in him absolutely! She has lived in English castles before and she declares they are nearly all haunted and that she has actually seen one of these ghostly inhabitants with her own eyes! According to tradition the great earl of Warwick, who was known as the “king maker,” is still uneasy in his mind because of the part he took in the dethronement of his former friend, Edward IV, whom he had made king. So at night, when all the castle is asleep, the ghost of Richard Neville stalks through the great armory, takes down its buckler and its sword and, with martial tread and clanging armor, walks up and down till dawn! In addition to this distinguished ghost and the castle where it makes its home the Marshes have leased the 3,500-acre estate, which includes 3 miles of Shakespeare’s river, Avon. “I haven’t seen the Warwick ghost yet,” Mrs. Marsh said the other day, “but I am looking forward to my first meeting with him. In Knebworth house, Hertfordshire, the last castle we occupied before leasing Warwick, there was a haunted room. That ghost was a woman. “I had loked for her in vain, for a long time, and had finally given her up, when, one evening, when I was not thinking of her at all, she swept into the room. She seemed to materialize suddenly from the tapestries that lined the walls and, standing directly in front of me, looked at me searchingly for an instant and then faded into the dim background of woven foliage whence she had emerged. “Some people may say this was merely the effect of my imagination, but when you live in England in an old castle a ghost seems the most natural thing in the world to you and you just have to believe in them. Really I am so used to renting a ghost that I really wouldn’t consider an English castle complete without one! But I never expect any of my friends to sleep in the haunted rooms. They are not so ghost-broken as I am. Wouldn’t Victorian photographers be amazed at what foolishness could be accomplished in mere minutes now, when it would take hours and strategic planning on their part back then to fake a “spook” photograph? This article from 1902 actually discusses a very famous photograph taken by Sybell Corbett in 1891 in the Combermere Abbey Library in Cheshire, England. I am not sure why an article written 11 years after the famous photograph was scrutinized by everyone at the time it was taken would warrant anonymity, keep in mind that the “Lord D” referred to in the article is really Lord Combermere. “The Society for Psychic Research is just now investigating a case of spirit photography, the importance of which seems to be considerably enhanced by its involving a well authenticated coincidence.” Said a prominent member of that famous association of scientific ghost hunters a day or two ago. “Miss Sybell Corbet, while staying with her sister at one of England’s most historic manor houses, took a photograph of the interior of the library. The lens of her camera was left uncapped for an hour. No one was present with Miss Corbet when the picture was taken, but when she developed the negative the semi-transparent head and body of an elderly gentleman appeared seated in a high-backed oak chair, his right arm resting on the arm of the chair, his other arm and legs being invisible. The figure could be seen only to the waist, and through the face was rather indistinct, it appeared to have a short beard. When the picture was shown to one of the nearest relatives of Lord D., the late owner of the mansion, she thought it exactly like him. Strangely enough, it turned out that Lord D., who previously leased the mansion to Miss Corbet’s sister, had, unknown to them, died a few days before in London, and was being buried during the hour when the picture was exposed. Miss Corbet is sure that her plate – one of a parcel of new ones – had not been exposed before. The only men in the house at the time were her youngest brothers, a butler, and two footmen, all of whom were young and beardless. 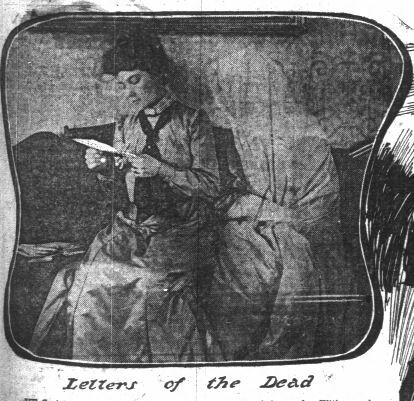 Fortunately, she preserved her photographic notebook bearing her record of the day and hour when the exposure was made, and this tallies exactly with Lord D.’s funeral notice. Miss Corbet is absolutely certain that the room was vacant when she uncapped her lens. The butler declares that one on entered while the exposure was being made. With regard to the possibility that one of the footmen might have been taken, either accidentally or as a practical joke, the photographer points out that the dress of the figure is that of a gentleman, whereas her sister’s footmen always wore livery. Her brother solemnly declared that he did not enter the room. The old manor in which the ‘ghost photograph’ was taken occupies the site of what was for centuries and abbey. The library, where the ‘ghost’ appeared, was part of the abbey’s refectory, and is said to be the only portion of the old building left. Some opine that this fact would make the mansion a likely place for a ‘spiritual manifestation’ to occur. Furthermore, the fact that certain limbs of the ‘ghost’ are missing is explained by the fact that an ancestor of Lord D., who fought in the peninsular war, had suffered an amputation of the same limbs. The supposition of these latter theorists is that this ancestor’s spirit had come to attend the funeral of the dead peer, who, although having died in London, was being buried at the moment from a church near his former home and ancestral estate. In the face of this evidence that the unexpected figure in the dead peer’s chair was of ghostly origin, Professor W.F. Barrett experimented on the effects that could be produced photographically by the transitory introduction of a human figure during the long exposure of a place. The results thus obtained by aid of a person coming into the room sitting on a chair and moving both his legs and left are were strikingly like the ghost picture unconsciously produced by Miss Corbet. These experiments lead Professor Barrett to suspect that one of the servants of Miss Corbet’s sister came into the room, sat down in the chair, moved his left arm, crossed his legs and then uncrossed them, looked down for a moment and then at the camera, saw that he was being photographed, so got up and went away, having been in the chair about twenty or thirty seconds of the hour of exposure. This moving of the head of the intruder would prolong the chin until it had the shaggy appearance of a beard and would give a figure of a ghost of an apparently older man, with no legs and a semi-transparent face. Such is Professor Barrett’s theory, in spite of the testimony that no one entered the room. The full name of Lord D. has been withheld from the public by the society, as is customary upon request. What are alleged to be genuine ‘spirit photographs’ are reported to the society to have been honestly produced by sir William Crookes, the eminent English chemist; also by Traill Taylor, Stainton Moses, Mme. De Esperance, and others. Advocates of spirit materializations use all of this data to prove that while you can deceive the human eye, you cannot deceive the eye of science, as the photographic camera has been termed. 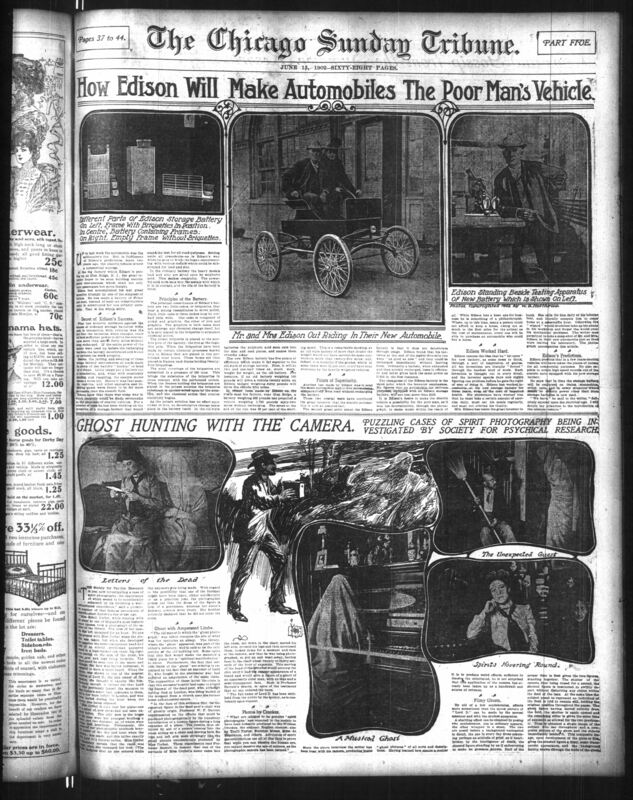 Since the above interview the writer has been busy with his camera, producing bogus “ghost pictures” of all sorts and descriptions. Having learned how simple a matter it is to produce weird effects, sufficient to deceive the uninitiated, he is not surprised that this application of the camera has already been taken up as a handicraft and source of revenue. By aid of a few confederates, effects more sensational than the spook picture of “lord D.” can be made by the merest amateur and with the crudest apparatus. A startling effect can be obtained by posing two confederates, one in ordinary apparel, the other wrapped in a sheet. The two are posed before a background variegated in detail, the one in every day dress assuming perhaps an attitude of grief, as if heartbroken by the intelligence of death, the sheeted figure standing by as if endeavoring to make its presence known. Half of the proper time is first given the two figures, standing together. The shutter of the camera then being closed for a second, the sheeted figure is instructed to swiftly depart without disturbing any object within the field of the lens. At the same time the subject posed to represent an individual of the flesh is told to remain still, holding the original position throughout the pause. The ghost figure having darted entirely from the field, the shutter is again opened and the remaining sitter is given the same time of exposure as allowed for the two previously. 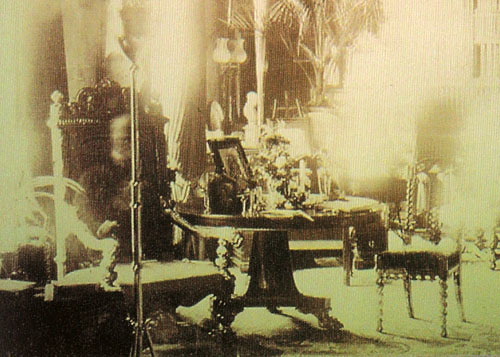 Thus is obtained a single image of the subject who sat throughout and a composite picture of the ghost and the objects immediately behind it. This composite image, upon development of the plate or film, gives the sheeted figure a filmy, semi-transparent appearance, and the background faintly shows through the folds of the sheet. In this weeks article we have yet another lawsuit because of spooks!! This time the poor plaintiff lost his case because the ghost did not answer the summons to appear in court and testify for the defense. This begs the question: could said spook be held in contempt and if they do arrest the ghost, what would they handcuff it to? Would barristers be required to defend spooks pro bono as they obviously would have no means to pay? London, March 30 – There is likely to be a slump here in ghost stories and creepy tales of haunted houses for some time to come. This may be anticipated as the result of an action for damages against the Daily Mail, which has been ordered to pay $450, plus costs, for publishing a yarn of a ghost. It was a well authenticated ghost too, being vouched for by no less a personage than Stephen Phillips, the famous poet dramatist, whose “Francesa an Paoio” is now being produced in America by Henry Irving, but that didn’t count for anything with a stoical and skeptical British jury. Mr. Phillips, who, by the way, once played the ghost in “Hamlet,” did not find that these weird manifestations exercised that stimulating effect upon his imagination that might have been expected in a man of his peculiar genius and temperament. He did not even try to interview the ghost. He and his family just ran away from it. They went to live in an inn in the neighborhood, Mr. Phillips paying three years’ rent to be rid of his lease of the haunted house. A friend of the poet, possessed of psychic powers and more daring, passed a night in the house to try and solve the mystery. He said he discovered that the manifestations were caused by the spirit of a child which had been strangled in the neighborhood by a farmer many years before. Apparently also the wraith of the murdered participated in the grewsome nocturnal rehearsals of the murder, for Mr. Phillips’ psychic friend averred that the distinctly heard the noises of strangling. In consequence of the publicity given to these stories, Charles Barrett, the owner of the house, declared that he had been unable since to find a tenant for it. He first brought proceedings against the London Daily Express, which had made a two days’ story out of Stephen Phillips haunted house. That paper, unable to summon the ghost to testify in its own behalf, settled the matter out of court by paying Mr. Barrett $1,200. 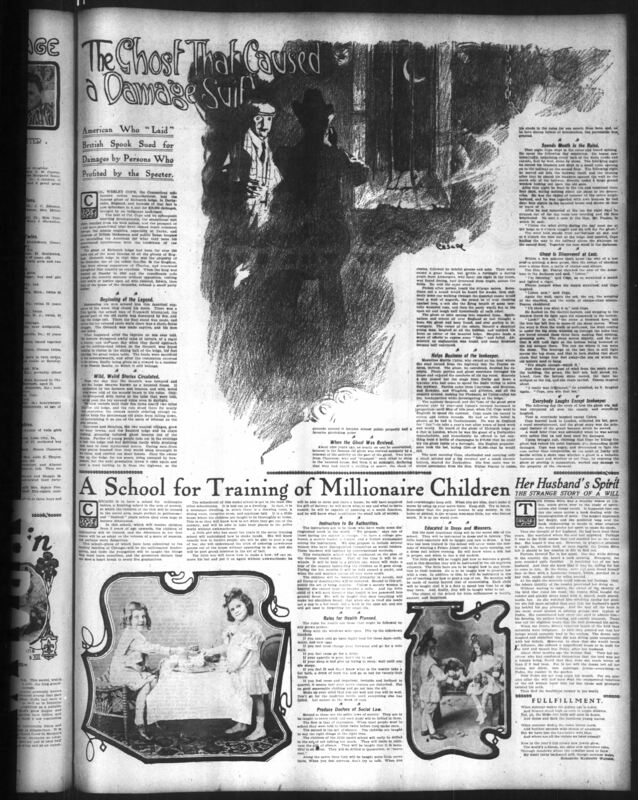 A spiritualist paper of limited circulation, which had also published the story, was let off with $50. 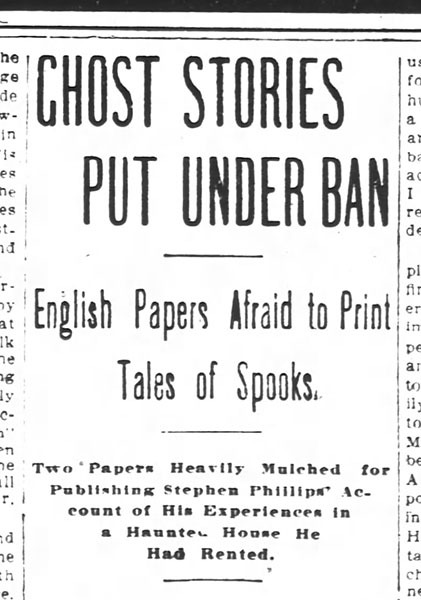 Several other papers ran the ghost in their columns have yet to be settled with. As it is, Mr. Barrett has made a deal more out of the ghost than he has lost by it. Whether it will stick to the house nobody knows. Even should it raise the roof off the house no mention would be made of it. In every newspaper office in the country orders have been issued to “kill” Stephen Phillips’ ghost with the editorial blue pencil whenever it appears. So far as the public is concerned, it is henceforth a dead ghost. And other ghosts will have a hard time of it getting into print unless their addresses are omitted. 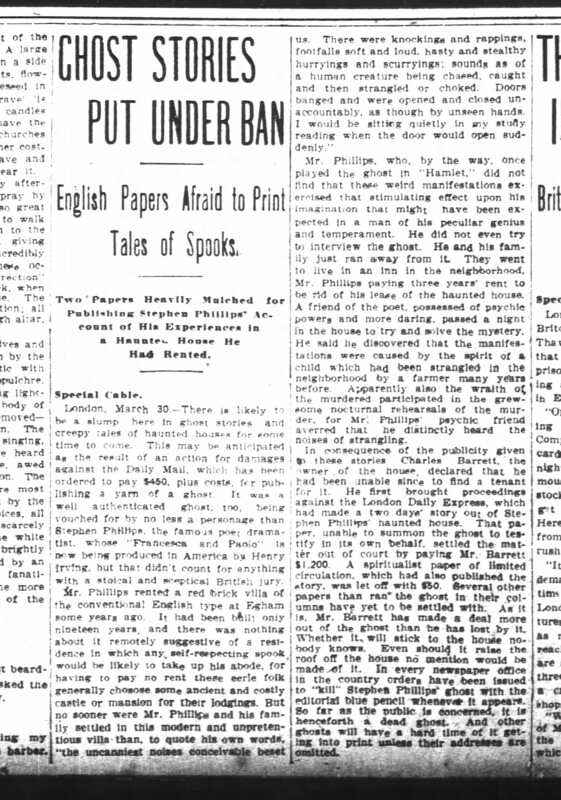 American Who “Laid” British Spook Sued for Damages by Persons Who Profited by the Specter. Col. Wesley Cope, the Connecticut millionaire cotton manufacturer, laid the famous ghost of Elchurch lodge, in Derbyshire, England, and because of that fact is now defendant in a suit for $15,000 damages, brought by an indignant innkeeper. The feat of col. 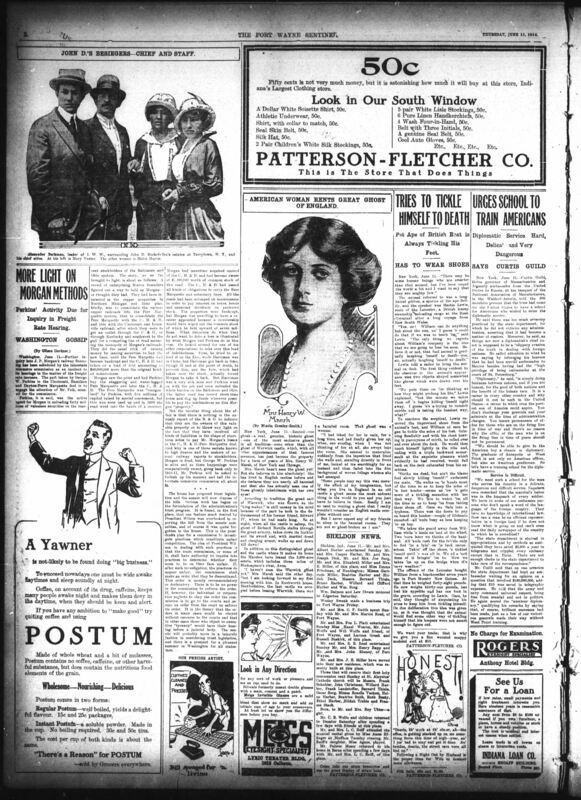 Cope and its subsequent startling developments, the sensational suit which resulted from his bold action, and the prospect of a still more sensational trial have caused much comment through the middle counties, especially at Derby, and hundreds of British tradesmen and public house keepers are excoriating the American for what they term his unwarranted interference with the traditions of the county. The ghost of Elchurch lodge had been for over 250 years one of the most famous of all ghosts of England. Elchurch lodge in that time was the property of the Groenths, one of the oldest families in the kingdom. They were strong supporters of Charles, and renowned throughout the country as royalists. When the kind was crushed at Naseby in 1645 and the roundheads rode through the country scarcely without opposition, visiting their wrath or justice upon all who resisted, Edwin, then head of the house of the Groenths, refused a small party shelter. Summoning his men around him this fanatical supporter of the weak king closed his doors. There was a little battle, the armed men of Cromwell triumphed, the greater part of the old castle was destroyed by fire, and only the lodge left. There the final stand was made, and within the ivy covered stone walls there was a short fierce struggle. The Groenth was made captive, and his men were killed. What happened after the capture no one ever told. The farmers whispered awful tales of torture, of a night of horror, and the next day when they dared approach and the soldiers had ridden on the Groenth was found hanging in chains in the dining hall of the lodge, his feet touching the great oaken table. The lands were sacrificed to the commonwealth, and after the restoration reverted to the crown, finally being given as a reward to a member of the Pearne family, to which it still belongs. From the day that the Groenth was tortured and slain the lodge became known as a haunted house. It was avoided by the farmers and tenants, and wild, weird stories were told of the sounds heard in the ruins. Children whimpered with terror at the tales that were told, and ran past the ivy covered ruins even in daylight. The new owners built their fine home nearly two miles from the old lodge, and the ruin stood there for nearly three centuries, the owners merely ordering enough repairs to keep the picturesque old place from falling down, and maintaining it as one of the spots of interest on the great estate. Claycross and Stratton, the two nearest villages, grew into busy towns, and the haunted lodge and its chain clanking, groaning tortured ghost became one of the fixtures. Parties of young people rode out in the evenings to visit the lodge and feel delicious thrills while straining their ears to hear mysterious noises. Daring men from many places boasted that they would sleep overnight in the ruins, and carried out their boasts. Once the owner shut up the lodge for ten years, being annoyed by trespassers, but the next generation threw it open again and made a road leading to it from the highway, so the grounds around it became almost public property and a favorite picnicking point. About nine years ago, as nearly as can be ascertained, interest in the famous old ghost was revived suddenly by a renewal of the activity on the part of the ghost. Two boys from Claycross, who had “stumped” each other to sleep in the haunted house, fled from it a midnight, declaring that they had heard a rattling of armor, the clank of chains, followed by doleful groans and sobs. Their story raised a great laugh, but within a fortnight a daring youth from Ambergate, who spent the night in the house, was found fleeing, half demented from fright, across the fields. He told the same story. Person after person heard the strange noises. Sometimes not a sound would be heard for weeks, then suddenly someone walking through the deserted rooms would hear a wail of anguish, the sound as of iron clanking against iron, a sob like the dying breath of some mortally wounded man, and then the party would flee to the open air and laugh half hysterically at each other. The ghost at once spring into renewed fame. Spiritualists and others all over England at last thought a bona fide ghost had been found, and sent parties to investigate. The owner of the estate, himself a skeptical young man, laughed at all the hubbub, and enjoyed his fame as owner of a haunter lodge. Skeptics made a score of efforts to expose some “fake” and failed. Absolutely no explanation was found, and many doubters became half convinced. Meantime Martin Upton, who owned an inn near where the road turned from the highway into the Pearne estates, thrived. The ghost, he calculated, doubled his receipts. Picnic parties and ghost searchers thronged his house and enjoyed the comforts of his tap room. Scarcely a day passed but the stage from Derby put down a traveler who had come to spend the night trying to solve the mystery. Parties came from Claycross, and Stratton, and Rowsley, and Wingfield, and Alfreton, and all the country around, making the Pheasant, as Upton called his inn, headquarters while investigating at the lodge. 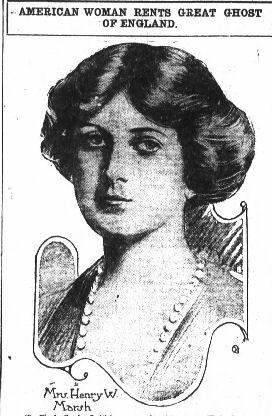 The mystery deepened, and the fame of the ghost grew greater year by year – and Upton’s receipts increased in proportion – until May of this year, when Col. Cope went to England to spend the summer. Cope made his money in cotton and cotton threads. He had as little belief in ghosts as he had in Confucianism. He was in England for “fun” – to take a year’s rest after years of hard work and worry. He heard of the ghost of Elchurch lodge at a club in London, where he was the guest of a Derbyshire manufacturer, and immediately he offered to be anything from a bottle of champagne to $10,000 that he could lay the ghost inside of a fortnight. His English acquaintance took the bet, laying £200 – or $1,000 – that he would fail. The next morning Cope, unattended and carrying only a small satchel and a big revolver and a small electric lantern, started for Derbyshire. His first move was to secure permission from the Hon. Walter Pearne to make his abode in the ruins for one month from date, and, as he bore strong letters of introduction, the permission was granted. That night Cope slept in the ruins and heard nothing. He spent the following day searching. He began to systematically, examining every inch of the walls inside and outside, foot by foot, stone by stone. The following night he moved his blankets and slept in a small room opening on to the hallway on the second floor. The following night he moved out into the hallway itself, and the evening after that he placed his blankets against the wall on the north side of the hallway, directly under a large grated window looking out upon the old gate. After that night he went to the inn and remained their four days, saying nothing about his plans or his discoveries. He was the object of interest of the entire neighborhood, and he was regarded with awe because he had slept four nights in the haunted house and shown no fear or trace of it. “Unless the winds shifts during the day meet me at the lodge at 9 o’clock tonight and we will ay the ghost”. The wind held steady from nor nor east all day, and at 9 o’clock the men met at the lodge and entered, Cope leading the way to the hallway above the staircase on the second floor. Together the men stood in the darkness. Within a few minutes there arose the wail of a lost soul – a sobbing, a deep groan, then the scrape of shackles over a stone floor, a rattle of chains- and silence. “I’m listening,” said Cope, as he scratched a match and lighted a cigar. Pearne jumped when the match scratched, and Cope laughed. Again the wail, again the sob, the cry, and the scraping of the shackles, and the rattle of chains – then silence. Pearne shuddered. “I’ll show you what it is,” said Cope. He flashed on the electric lantern, and stepping to the window threw its light upon the stonework at the bottom. “Look!” he said, “the stone is loosened here, and the iron bar left free to move – if the stone moves. When the wind is from the north or northeast, the wind coming in under the big stone whistles up through the holes that are bored around these three bars, making that sobbing, groaning noise. The stone moves slightly, and the bar that is still held tight at the bottom being loosened at the top scrapes there. You can see where it has worn the stone. The leverage on the bar that is still tight moves the top stone, and that in turn shakes that short chain which hangs four feet away – the one on which the old lantern used to hang. Just then another gust of wind from the north struck the building, the groan, the half sob, half shriek followed, then the bottom stone moved, the tight bar scraped at the top, and the chain rattled. Pearne laughed aloud. The following day the story of how the ghost was laid was circulated all over the county, and everybody laughed. That is, everybody laughed except Upton. Cope hurried back to London, collected his bet, gave a royal entertainment, and the ghost story was the principal feature of the grand banquet which he served. A week later Cope was astounded when he was served with notice that he had been sued for damaged. Upton brought suit, claiming that Cope by killing the ghost had ruined his hotel business, and demanding £3,000 damages. Cope was angry, and determined to fight the case rather than compromise, so the court at Derby will decide within a short time whether a ghost is a valuable business asset and whether or not Cope, by exposing the ghost or proving it nonexistent, worked any damage to the property of the claimant. ****Unfortunately, I have not been able to find a follow up article yet to find out who won this lawsuit, but I will keep digging! !